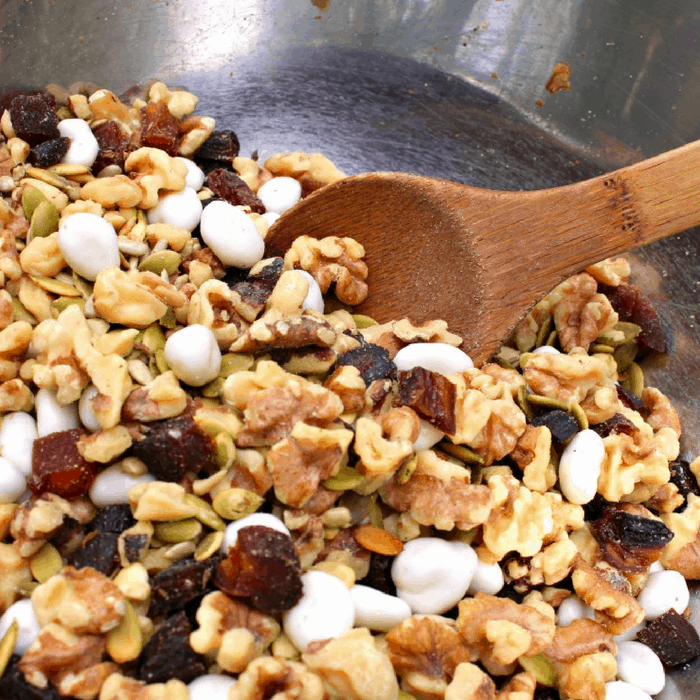 This delicious trail mix recipe, packed full of superfoods, makes the perfect addition to any hiking trip. Featuring organic toasted seeds, nuts, and dried fruits, for just a hint of sweetness, this mix will give your body the fuel it needs to stay energized throughout any excursion. If there’s one thing I’ve learned in my years of hiking the Smokies, it’s the importance of staying hydrated and keeping our bodies nourished. I always make sure to bring a few snacks in my pack because you never know when hunger pangs might strike, or when 1 wrong turn might change your 2 hour hike into a 6 hour hike. Not that I would know. With a world full of junky food, I try to purchase organic snacks whenever possible. Or, buy the natural and organic ingredients to make my own, like I’ve done here. One of the most affordable natural and organic option brands I’ve come across is Simple Truth®, which is only available at Kroger. They have a great variety of items that are available to purchase either in store or online, which makes it super convenient when you’re a busy mom like me. Kroger also sells a really awesome brand of organic tea that my whole family loves, called Honest Tea® . We usually take it on our hikes for snack time, to get a little break from endlessly drinking water. It uses only real ingredients and comes in a variety of unique flavors. My favorite is the Unsweet Peach Ginger Tea, while my husband prefers Pomegranate Blue Flavored Herbal Tea that is just a tad sweet. Their teas that are just a tad sweet actually use real fair trade organic sugar, which brings me just a little extra twinge of happiness. Seriously! You can actually find a great collection of Honest Tea recipes and tutorials, by visiting their website. So, in honor of National Organic Month last month (September), whip up some Apricot Bliss, grab your Honest Tea, and hit the trails! Ingredients: Note: I used Simple Truth brand for everything. If you are using walnut halves, crush or chop the walnuts before use. I used a meat mallet to crush the halves into chunks right in the bag. 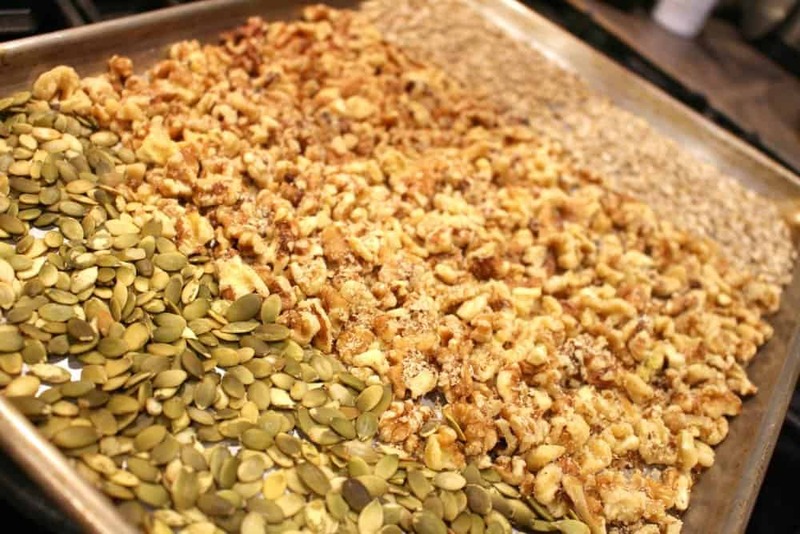 Using a baking sheet, spread out your walnuts, pumpkin seeds, and sunflower seeds in a single layer. Toast at 350° for 5 minutes. This helps to bring out the flavor and natural oils. If desired you can spritz the nuts and seeds with oil and add a sprinkle of salt prior to toasting. Meanwhile, dice the dried apricots into bite sized pieces. Straight out of the bag, they are a little too big to go right into the trail mix. After your toasted nuts and seeds have cooled, mix together all the ingredients to combine. Store in an airtight container for up to 1 week. We love Kroger!! Will have to try all this out! Yum! Hiking is so much fun and bringing along amazing snacks and drinks definitely adds to the fun! The Smokies are so beautiful, too!